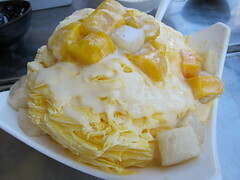 With Southern California “June Gloom” wearing off now thanks to July, it has me craving cold dessert. Cold as ice – or, cold as snow in this case. 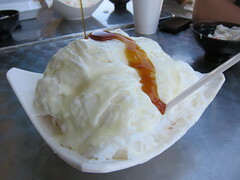 I had heard about the “upgrade” to traditional Taiwanese shaved ice from Danny, CathyÂ and a few others, in that the condensed milk is actually folded into the ice for some serious creamy-sweet-cold integration. Whereas the plastic tops sealing cups of milk tea at boba shops were probably the last technology in Taiwanese desserts I was aware of, this one seems to be an actual revolution of dessert itself. When I saw that the snow actually came out in sheets,Â each dishÂ was a massive landscape and sweet firestorm to behold. No more crunchy ice or uneven distribution of condensed milk from bite to bite. Just good ol’, cold, sweet, softÂ and creamy (yet airy?) goodness. You can get varieties with caramel pudding on the bottom and syrup on top, another with strawberries and mango. My personal favorites, though, were the mango-flavored snow with mangos and mochi (for some potent mango goodness) and the green tea-flavored snow with red bean and mochi topping (expressly for your matcha tooth). On the weekend, you’ll be waiting quite awhile for a table at Class 302 (which is Taiwanese school code for 3rd grade, 2nd class) as they also serve food, but snow is hands-down the thing to get here. You’ll want some as we head deeper into the summer. Just remember: It’s even hotter in San Gabriel Valley, so bring friends to share flavors. 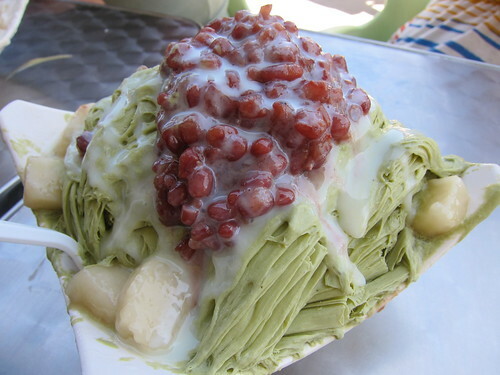 More Taiwanese discoveries to come at later dates… A girl’s gotta reconnect with her blood-native cuisine, right? It was one of my last nights in Taiwan when my mom and I met one of her old childhood friends at Su Hung, a restaurant surprisingly located in a shopping structure adjacent to a subway station. As we ascended the stairs, a hot pot restaurant caught my eye – but I was ever lucky that Su Hung was the one that came recommended. I had decided to resist the hype of Din Tai Fung, further dissuaded by word of endless waits and an eagerness to avoid being lumped into the “eating tourist” demographic. After all, why settle for the merely better-than-Arcadian version of the restaurant chain, with possibly an even worse wait? I had a bloodline to honor. 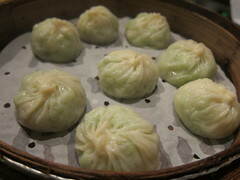 Su Hung offers not pork soup dumplings, but rather loofah-greens-and-shrimp soup dumplings. You can eat more of these than the very popular pork version and you’d be hard-pressed to find a more specialized soup dumpling anywhere else in Taipei – much less in America. There is less soup in these, but they’re a nice departure for diners looking for something lighter, a little different and less obvious. There are plenty of other dishes at Su Hung that will quench your appetite for the savory, including the very delicious tofu dish which comes in a stone pot immersed in a broth made with braised crab eggs. Though I enjoyed pretty much everything that came out from the kitchen, this was my favorite preparation of tofu during my entire Taiwan trip (and you can guess that with all the meals shared with relatives, vegetarian and non-, there were a lot). Never the brave one to crack the middle innards of a crab shell open (I’m a leg woman), I really appreciated this delicious sauce and barely fried tofu with a texture that was silken yet could hold its own to the temperature. 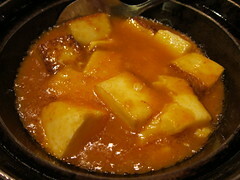 Boiling stone pots never fail to excite me as they approach the table – and this one far exceeded even my expectations. 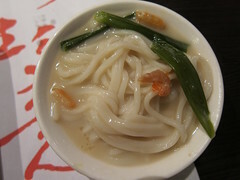 If you’re looking for a unique yet delicious noodle dish, order the Simmered Noodles – a simple bowl of wheat noodles-in-chicken-broth that attains its complex taste and texture by, you guessed it, simmering for a long time. It’s dressed with tiny dried shrimp and green onion, and was perfectly comforting for that rainy day we happened to eat at Su Hung. Divy up that medium-sized bowl with your dining partners, and your seconds and thirds will show you that you wished the portion was even bigger. Guess you’ll have to order another, or another of their specialties. And of course, the title picture may evoke memories…of the East Village. Rather than being portioned out individually at Momofuku for $9 a pop, you’ll get enough green onion, wilted cilantro (just like New York) and braised pork belly to fill 6 “bao” tacos for NT $360 (USD $12). You actually are given only 4 shells to begin with, but the waitstaff will graciously bring you more should you have more honey-braised pork belly to stuff them with. Of course, this is an unfair price point and cost-of-living comparison, but it’s just one more reason this dish is a definite must-order when you dine at Su Hung. It’s your favorite Hunan-style hamburger, ever that much closer to the source. No meal is complete without dessert, and Su Hung has the perfect version of your typical red bean-filled sesame rice balls you would otherwise see being wheeled around, cold, on carts at San Gabriel Valley dim sum. 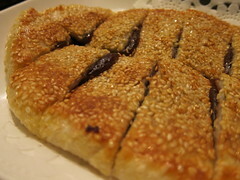 This version comes hot and flat, like a freshly-made, sweet rice crepe, with the red bean oozing out from all sides at which it is cut. 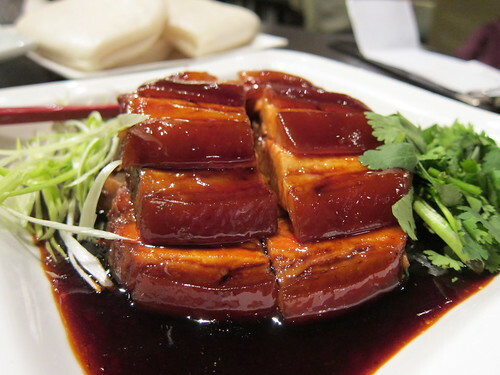 Su Hung offers unique and well-executed dishes that will surely enrich your Taipei dining experience. It was ironic that the Taipei Times’ review of the place published online on the very day I dined there. It had mostly favorable views, consistent with my pleasant experience.Â It seems as though the businessmen that line their tables are really on to something – and those looking for a solid meal, period, would serve themselves well to take their cue.